Whipped cream | Choc - o - late - N - More! Pour the chocolate syrup into a medium microwave safe bowl and microwave 2 minutes on high. Do not allow to boil. Stir peanut butter into hot chocolate until smooth. Allow to cool to room temperature. 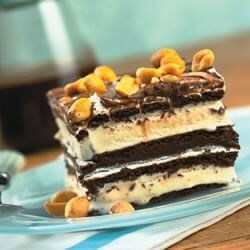 Line the bottom of a 9×13 inch dish with a layer of ice cream sandwiches. Spread half the whipped topping over the sandwiches. Spoon half the chocolate mixture over that. Top with half the peanuts. Repeat layers. Freeze until firm, 1 hour. Cut into squares to serve. Preheat oven to 400 degrees F. Bake pie crusts blind by either using pie weights in pie crusts or prick holes in bottom and sides to prevent bubbling. Bake for 8 minutes. Remove from oven to rack. Decrease oven temperature to 375 degrees F.
In large saucepan on low melt butter and chocolate, stirring occasionally. In medium bowl, combine sugar and flour with wire whisk. In another bowl, whisk together eggs, vanilla and evaporated milk. Add a couple of tablespoonfuls of the melted chocolate mixture to the egg mixture and stir. Add both sugar and egg mixtures to pan of melted chocolate. Stir to combine. Increase heat to medium and stir constantly for 10 minutes. Evenly divide filling between the 2 pie pans. Bake for 30 minutes. Heavily grease sides and bottom of a 9 inch pie pan with regular (not light) stick margarine. Crumb cookies in food processor and press into pie pan. Bake this for 10 minutes at 350 degrees. Soften ice cream in refrigerator for four hours (or 1 hour room temperature). Fill baked cool pie shell with ice cream and cover with wax paper. Freeze. Melt chocolate chips and whipping cream over lowest heat and spread over pie. Refreeze.